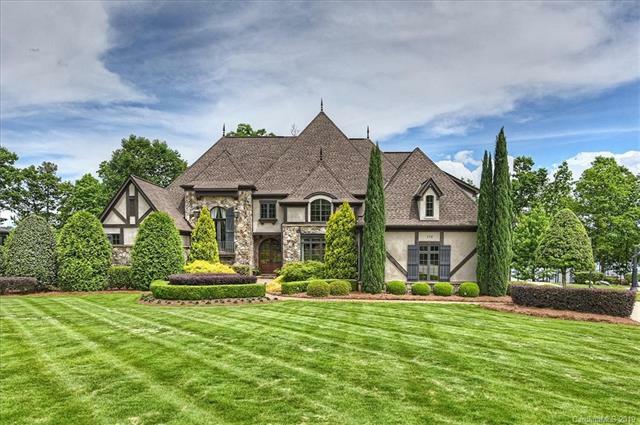 A majestic tudor-style estate with picture perfect views of the lake and Trump National Golf Club Charlotte! This gorgeous 5-bedroom home will take your breath away with pristine grounds & three levels of luxurious living & entertaining space. Peaceful covered terraces, screened-in porch, outdoor kitchen, & pool with hot tub allow you to truly appreciate lake living. The thoughtful floor plan allows open & light-filled spaces with water views at every turn. Other features include 4 fireplaces, incredible chef’s kitchen, lovely master suite, spacious secondary bedrooms each with en-suite bath, 2 laundry rooms & elevator. No detail has been overlooked in this impeccably maintained home!